After the postponement last September, Savvy Entertainment will bring music industry executive, author and philanthropist Shanti Das to the island as part of her mental health awareness initiative – Silence the Shame. “Ms. Das started Silence the Shame under Hip-Hop Professional Foundation, an organization she founded,” a Savvy Entertainment spokesperson said. “I hope to spark an international conversation that will lead to increased awareness and funding to support those living with mental health conditions,” says Shanti Das. “We are pleased to bring Shanti Das to Bermuda so that we all can share in the Silence the Shame initiative and help to bring awareness to mental health.” said Savvy Entertainment Chief Operating Officer, Danilee Trott. Savvy Entertainment has also partnered with Bermuda Hospitals Board for the mental health awareness events. “The general public tend not to realize that mental illness affects a significant number of people in the community, many of whom are able to learn to cope and manage their condition. An understanding society, where people are caring and supportive of those with mental illness creates a healthy environment for the community at large. At MWI we encourage dialogue and efforts that foster this attitude. So, we are happy to take part in the Shame the Silence initiative’s panel discussion here at home”, says Preston Swan, BHB VP Quality and Risk Management. “The Foundation salutes Savvy Entertainment for recognizing the continued need for dialog around the topics of stigma against those who have a mental illness. We look forward to working with Savvy Entertainment and the Silence the Shame team, and we hope that the public will come out and support this initiative”, says Bermuda Mental Health Foundation Spokesperson. 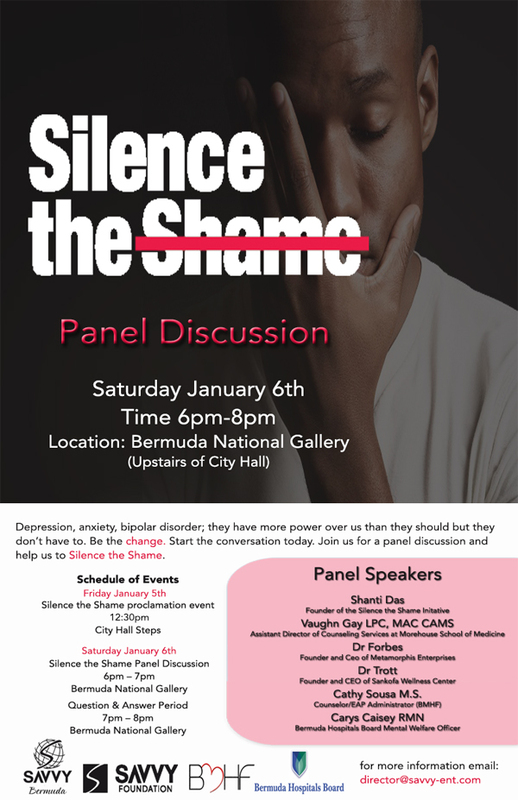 On, Friday January 5th, Savvy Entertainment will be hosting a Silence the Shame Proclamation on City Hall Steps at 12:30pm and on Saturday January 6th the Silence the Shame Panel Discussion will take place at 6:00pm at the Bermuda National Gallery. Panelists will include Ms. Das, Vaughn Gray, Assistant Director of Counselling Service, Morehouse University School of Medicine; Dr Khaalida T Forbes, Founder and CEO of Metamorphosis Enterprises; Dr Larry Trott, Founder and CEO of Sankofa Wellness Center; Cathy Sousa, counsellor and member of Bermuda Mental Health Foundation; and Carys Caisy Mental Welfare Officer at the Mid-Atlantic Wellness Institute. Both the proclamation and the panel discussion are free and open to the public.